Usually the commercial arm wrestling between Russia and Ukraine explodes in the winter over gas scandals. 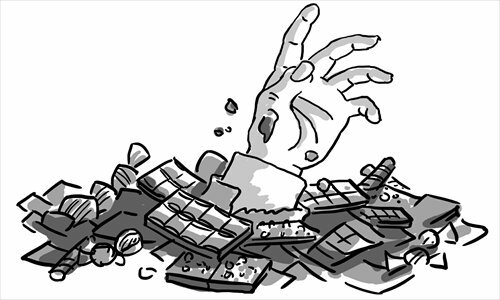 But since early this year, Russia and Ukraine have engaged in a chocolate war, as Ukrainian candy giant Roshen’s chocolates and confectionery were banned in Russia. So why has Russia banned the import of Roshen’s candy products? The official statement claimed that the restrictions were caused by repeated violations of sanitary norms and that, benzopyrene, a harmful chemical component, has been found in Roshen’s chocolate tablets sold in Russia. Roshen denies the accusations, claiming in the past 15 years any complaints from any customers have resulted in detailed investigation and verification. The details are being negotiated, but it has been already more than a month since Roshen’s products were removed from store shelves. Roshen has a production capacity of 450,000 tons a year and sells more than 200 sorts of sweets. It is the 15th largest confectioner in the world. The brand exports its product mainly to the former Soviet countries and North America. The company has almost doubled its profit in Russia, but if the ban is not lifted, Roshen will suffer $200 million in lost sales by the fourth quarter. Another possible reason for the restrictions could be related to oligarchic politics. Poroshenko was a supporter of Ukraine’s color revolution in 2004. Since then he had changed his opinions about politics, but his aggressive stance on Russia was noticed by both Ukrainian and Russian politicians. It’s also possible Russia wants just to protect its market. More clearly it can be seen as Russia’s simple retaliation against Kiev’s taxing imported vehicles. Importers of Roshen products such as some Central Asian and Caucasian countries, as well as Moldavia and Belarus have announced that they have found Roshen’s products to be perfectly safe. Another possibility is the power balance between EU and Russia. Ukraine envisages to sign a free trade agreement with EU in a few months. If Ukraine joins the agreement, Russia will risk losing a significantly important market in the region. Similarly Russia is trying to convince Ukraine to join the customs union with Belarus and Kazakhstan. Therefore, it’s also likely that Roshen’s products were banned as a warning to Ukraine for its rapprochement with EU. Russia and Ukraine have a shared history and culture. Long under Russian influence in Soviet times, Ukraine was the second most important member of the union. Since the collapse of the Soviet Union, Russia has been trying to maintain its influence over the former Soviet countries. Paradoxically the hardest blow was given by the closest brother, Ukraine. Today Ukraine continues its rapprochement with EU with more affirmation of its sovereignty. But Russia apparently doesn’t accept this reality and shows its determination to maintain its influence on Ukraine. Kiev tries to keep the friendly relations with both sides. According to Ukraine, the EU and Russia should not feel rivalry, because the trade exchange will be based on the principles of the World Trade Organization, which Russia joined in August 2012. But despite calls from the Ukrainian side, Russia continues to maintain pressure. In the Russian-Ukrainian borders Ukrainian cargo checks were reinforced from the beginning of August. If the chocolate war cannot be resolved, it could be a cold winter in Ukraine.